January 31 at 2 p.m. Actors, artists, dancers, musicians, and vocalists share their talents to brighten your winter and raise funds for arts programming. February 14 at 1 p.m.
Tickets: $30 dinner performance, $25 luncheon performance. Show begins 45 minutes after the meal is served. 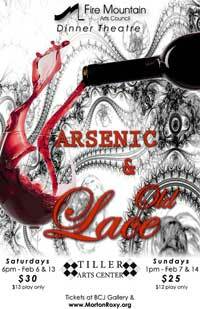 Enjoy the classic comedy Arsenic and Old Lace along with and a tasty, catered dinner or luncheon at the Tiller Arts Center. Meet the charming and innocent Martha and Abby Brewster, who populate their cellar with the remains of socially and religiously “acceptable” roomers. The family’s antics will keep you laughing! April 30 at 7:00 p.m.
Tickets also available at White Pass Country Museum, Packwood, (360-494-4422) and BCJ Gallery, Morton, (360-496-0542). Open seating. Will the strong and true Preston Goodly be able to save the lovely and head-strong Daisy Darling from Dirk Dagger’s evil plot to ruin her family? The Roxy Players traveling troupe debuts, combining classic melodrama with Vaudeville-style music and comedy. Proceeds to benefit White Pass Country Museum and Fire Mountain Arts Council. May 20 & 21 at 7 p.m. Confined to her uncle’s manor, the orphaned Mary nurtures a hidden garden that seems to have magical effects on those who enter it. Young actors demonstrate their acting, music, and stagecraft skills in this adaptation of the literary classic. OnStage Theatre Education Program Production – KIDS Time to Play! OnStage Children’s Theatre Education Kids’ Intensive Drama School (KIDS)- Children from 6 to 18 develop will work together in groups to develop unique adaptations of the beloved childhood story Where the Wild things Are by Maurice Sendak. Participants will create original scripts, characters, set pieces, costumes, even lighting, guided by Lead Instructor Jennifer Kinsman. July 9 at 7:00 p.m.
July 23 at 7:00 p.m.
Will the strong and true Preston Goodly be able to save the lovely and head-strong Daisy Darling from Dirk Dagger’s evil plot to ruin her family? The Roxy Players traveling troupe comes home with classic melodrama and Vaudeville-style music and comedy. August 6, at 7:00 p.m.
August 9, at 7:00 p.m.
August 10, at 7:00 p.m.
August 13, at 7:00 p.m. This Tony-Award winning musical intertwines the enchanted world of the “tale as old as time” with the well-loved tunes from Disney’s movie and Braodway production. Music by Alan Menken; lyrics by Howard Ashman and Tim Rice; based on the book by Linda Woolverton. Presented through special arrangement with Music Theatre International (MTI). All authorized performance materials are also authorized by MTI. September 30 at 7:00 p.m. 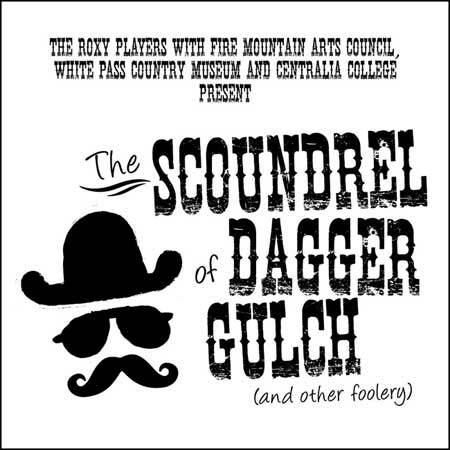 Presented by the Roxy Players with Fire Mountain Arts Council, Centralia College, and Onalaska Alliance. 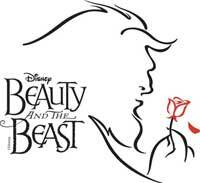 December 3 & 10 at 2 p.m.
* December 9 performance cancelled due to inclement weather. Tickets will be honored at the December 10 performance at 2 pm. With visions of sugar plums dancing on stage, the story of The Nutcracker is most often seen as the ballet of that name. This children’s play is set to the familiar dreamy music by Peter Illyich Tchaikovsky. 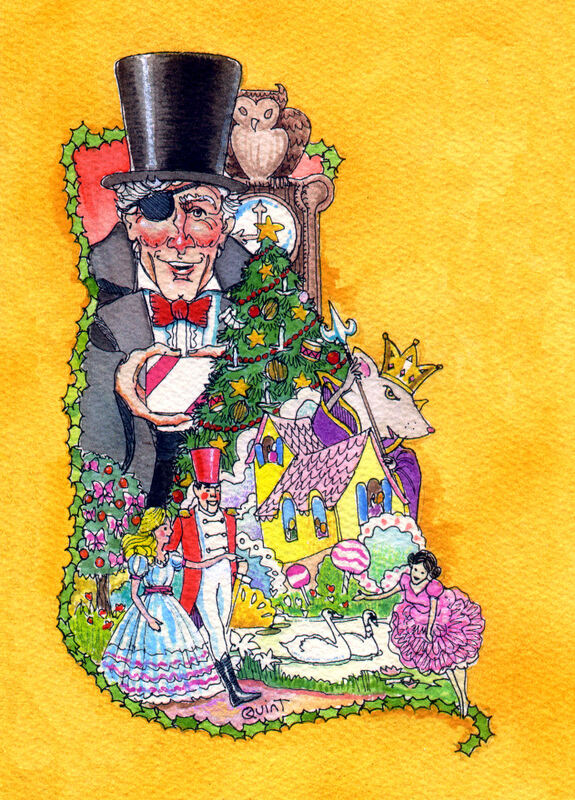 The children, Fritz and Marie are visited by Uncle Drosselmeyer who brings three very special dolls for their Christmas presents. But the enchantment begins when Marie sneaks downstairs to say goodnight to the dolls, Clara, the nutcracker, and the toy soldier. She falls asleep holding the nutcracker. As she enters dreamland the lights flicker, the Christmas tree grows and the beautiful dolls come to life and we enter the illusion of the Land of Enchanted Dreams where snowflakes talk and dance, nutcrackers turn into enchanted princes and dolls are the ballerinas.